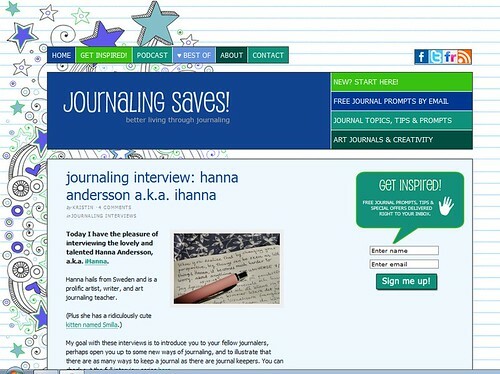 Kristin Donovan has published an interview with yours truly at her blog Journaling Saves, check it out! During the past months Kristin’s blog about journaling has become one of my absolute favorites, and I read every post she writes. I guess it is because I looove journaling and have always done so. Long before I felt that I was a very creative person I was writing in my diary on most days. And to me it is not just something that is fun but also very important for my health and well-being. If I don’t write for a few days I feel confused and need to get back to the habit of writing. I believe journaling, or as I say “keeping a diary”, is something that everyone will benefit from! Everyone! If you are the kind of person that likes to explore what is possible for yourself, to learn new things about your capacities and to keep “self developing” (and read those kind of books) you should start writing a journal today, right now (if you haven’t already started)! It is such a great help in so many ways, and Kristin explains it very well on her site in posts, podcasts and videos, with examples and prompts and now lately with the interview series where I am just one part of the whole. A favorite book about journaling is Lynn Nelson’s book Journaling and being, it includes mindfulness, self-exploration, creative writing and journaling in a wonderful mix. If you are new to keeping a diary I would suggest test writing every day for a month and see where it leads you and if it is something you would enjoy. Get Kristin’s inspiring e-book 30 Days to Journaling Life to get you started. I’m reading it right now and doing the exercises, and I’m thrilled at how fun it is to follow the directions of someone else. The book is geared toward newbie writers but as an oldie in the game I can still learn new things, lucky me! This entry was posted in Inspiration and tagged About Me, diary writing, interview, journaling. Bookmark the permalink. yikes – book references in your entry – and I cannot resist going in search for them! I am a paper nut, a bookaholic and a writer (who wishes she had artistic abilities, too, but alas, I must be happy with my stick figures and hippy flowers that I can muster). So happy to find this spot and see what’s up in art journaling! I do treat myself to those Somerset magazines from time to time and ogle the Art Journaling editions. Hope to learn by reading about it and listening to all y’all who do it so fluently. I haven’t been to this blog, so I am off there now to have a peep and read your interview!